Email marketing and direct mail marketing can be two viable ways to generate real estate leads, but — like any aspect of sales and marketing — results are impacted by several things, including the effectiveness of your message, the image you project to prospective clients, and the visibility you establish through networking, online marketing, and advertising. Developing and implementing a cost-effective real estate marketing plan may seem like a tall order, but if you approach it in a methodical and proactive way, your pipeline of prospects, sales leads, and active clients will grow. Are you planning on sending out real estate prospecting letters to your farming area in the near future? If so, here are several tips to help improve your results and generate more real estate leads. Don’t reinvent the wheel. Unless one of your strengths is writing compelling, results-oriented prospecting letters, then there’s a distinct advantage to using professionally written real estate letter templates. It can help save an immense amount of time and significantly increase your productivity. Having access to real estate letters that are already 90-95% done can streamline your marketing efforts and conserve energy for other sales activities. There’s an online kit of real estate marketing letters* you can download that includes real estate introduction letters, prospecting letters, new agent announcement letters, appointment reminder letters, referral requests, home staging letters, real estate thank you letters, open house announcements, short sale prospecting letters, expired listing prospecting letters, FSBO real estate prospecting letters, and holiday greeting letters. 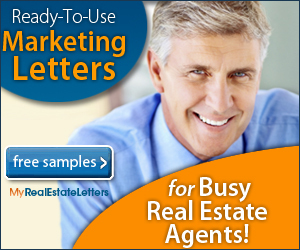 This collection of real estate marketing letters contains over 300 easy-to-use templates for almost any occasion and purpose. Whether or not you decide to purchase the 320 real estate letters (and 260 articles for your blog or real estate newsletter), this website offers dozens of prospecting ideas for real estate agents, brokers, and Realtors. Check out the variety of marketing letters available. The site also features a free example of an expired listing prospecting letter that you can adapt to your own own needs. Know your strengths and weaknesses. One of the cornerstones of an effective real estate marketing plan is taking the time to do a “SWOT” analysis. Identifying your strengths, weaknesses, opportunities, and threats is the first step toward developing a successful real estate marketing strategy. Once you know your competitive advantages, your Unique Selling Proposition (USP), and any weaknesses or threats you need to address, you’re in a strong position to make the best possible impression on your prospects and clients.. Details make the difference: You can increase the probability that your real estate letters will be read, taken seriously, and responded to by proofreading them carefully — especially after making last-minute edits and revisions. Liberal use of paragraphs (white space) can help make your marketing letters look more inviting, organized, and easier on the eyes. Numbered lists — like the one you’re reading — and/or the use of bullets points also serve the same purpose. Increase your “open rate”: The somewhat discouraging aspect of mailing out real estate prospecting letters is that a certain percentage of them do not get opened or read. If it has the look and feel of a “mass mailing” (which it basically is), then some of your recipients will dismiss it as “junk mail” — even those who could potentially benefit from your services.There are a number of strategies for reducing the “throw away rate,” such as enclosing something free like an imprinted packet of garden seeds, a real estate newsletter, or a free calendar for their refrigerator. Printing a short blurb on the outside of the envelope about the free gift or valuable information inside can be another way to prompt recipients to look inside — and, very often, that can be the first hurdle to getting your message read by prospective clients. One strategy that some real estate agents use to arouse curiosity and increase the “open rate” is to simply print their name and return address on the envelope, rather than making it obvious that the letter is from a real estate agent, Realtor, or agency. Experimenting with different approaches, such as using a font that resembles handwriting, can often lead to a higher response rate. Cultivate a positive attitude. The quality of your thoughts, attitudes, daily habits, and expectations can have a direct impact on the impression you make on people. (You know what they say about only having one chance to make a great first impression!) Attitudes, both positive and negative, have a way of seeping into every aspect of your communication — including sales letters, emails, and telephone contacts. Sending out real estate marketing letters to your farm area can and often does result in inquiries, referrals, visits to your website or real estate blog, and increased name recognition. The following articles on various aspects of real estate marketing will provide you with actionable ideas for increasing engagement with your target audience, expanding name recognition, maintaining Top of Mind Awareness in your farm area, generating leads, and converting more prospects into real estate clients. Seven Reasons Your Listing is Still on The Market (and what to do about it)! Thanks for checking out my latest blog post on real estate marketing strategies. Feel free to email me if you have any questions, comments, or inquiries about this real estate marketing blog, my new blog on ideas for starting a business, or my blog-writing services.